Separation of light transport into direct and indirect paths has enabled new visualizations of light in everyday scenes. However, indirect light itself contains a variety of components from subsurface scattering to diffuse and specular interreflections, all of which contribute to complex visual appearance. In this paper, we present a new imaging technique that captures and analyzes these components of indirect light via light transport between epipolar planes of illumination and rays of received light. This plane-to-ray light transport is captured using a rectified projector-camera system where we vary the offset between projector and camera rows (implemented as synchronization delay) as well as the exposure of each camera row. The resulting delay-exposure stack of images can capture live short and long-range indirect light transport, disambiguate subsurface scattering, diffuse and specular interreflections, and distinguish materials according to their subsurface scattering properties. "Acquiring and Characterizing Plane-to-Ray Indirect Light Transport"
An image stack of varying delay on the x-axis and exposure on the y-axis, with values (td, te) in microseconds. Epipolar images occur when |td| < te/2, and non-epipolar or indirect light otherwise. 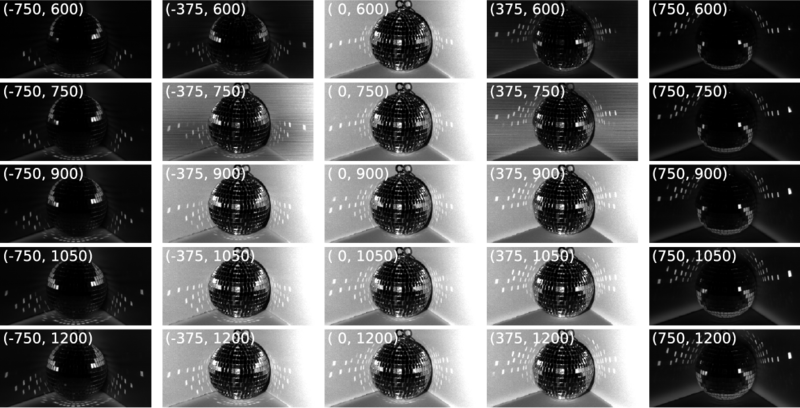 Notice how the specular interreflections of the disco ball move vertically as delay increases in one row corresponding to indirect light paths jumping from illumination to received plane. The size of the interreflections band is controlled by exposure. All images are brightened for visualization. Synchronized scanning system [O'Toole et al., 2015] We utilize a fixed offset between projector plane to camera pixel implemented as a synchronization delay. We also utilize an exposure time to increase the illumination band width. Stack of images performing the synchronization delay sweep. Stack of images performing the exposure sweep. The right delay reveals hidden inner structure.